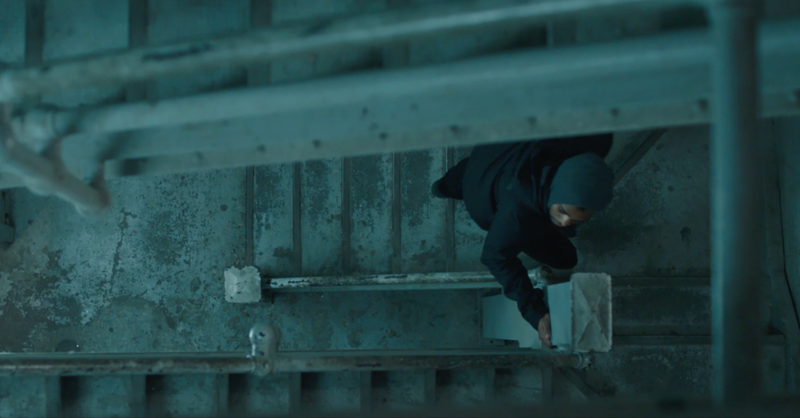 Join us Friday March 2nd at 9pm for the Canadian Premiere of RIVE at the Art Gallery of Ontario, Jackman Hall, 317 Dundas St W.
In the wake of another disappearance at work, Marcus arrives at Jaime's loft for a date they've both been working up to for months. A passionate kiss quickly unveils ulterior motives as their true selves come into the light. A physiological thriller exploring the power of skin and what happens when too much trauma hits its boiling point. You give away your trust to easy. You know nothing about me. Mandi (Actor/Writer/Producer) is a graduate of the American Academy of Dramatic Arts, Los Angeles. When she returned to Canada, she booked the role of Isobel in the feature film Nightrunners which premiered at ZIFF, and won Best Feature Film at the Los Angeles Thriller Festival. She co-created and starred in Bonfire, which premiered at the LA Shorts Festival and was recently Short of the Week. In television roles, Mandi has appeared on Cineflix’s Surviving Evil, Discovery ID’s Murder U and recently appeared in CTV’s Four In The Morning. Last January she returned to the stage to produce and star in Outlaw Theatre’s Collective Karla and Grif. This is where she met and started to collaborate with RIVE’s director Angela Besharah. Mandi then wrote, starred in and produced, along with 920 Films, the short film Out of Love, which is currently in post-production. Immediately following, she decided to write and produce, RIVE. She is excited to share RIVE with audiences, as she feels it could have a powerful affect. Dalmar Abuzeid (Actor) was born and raised in Toronto, Ontario and began acting at the age of 11. His major credits include the critically acclaimed Degrassi TNG, E1’s tween comedy series Majority Rules, as well as guest appearances in Pompeii (2014) and on the CTV, CBC and Netflix networks. He also hosted and produced content for TVOKids' after-school block for 3 years. Outside of acting Dalmar speaks fluent French and enjoys music, soccer, basketball, traveling and anything he can learn about. Pauline Decroix (Editor) started her editing career in France working for CANAL+, TF1 or France Television. There she cut lifestyle, drama and documentary programming, including the CANAL+ TV series Hard, which was later picked up by HBO. In 2009, Decroix made the move to Canada, to expand her career as an editor. As she want to pursue her career in the narrative, in 2016, she applied, and became a resident of the 2016 Editors' Lab at the Canadian Film Center in their Cineplex Entertainment Film Program. Jordan T Gray (Producer) is a Writer/Actor/Producer that lives in Toronto, Canada. He has written over 20 short films and has produced half of those with his production company 920 Films. He's happy to have produced 'Rive' and very excited to see how it will affect the audiences at different film festivals. He's looking forward to continue acting, writing and producing in 2017. ANGELA BESHARAH (Director/Writer/Producer) is a director, actor and acting coach working in film, television and theatre. She has directed 12 plays, 7 of which were original productions. Karla & Grif had a sold out run, You Said Love was extended by audience demand, The Keeper’s Secret and MAD5/still alive both received 4 star reviews. The Churkendoose broke Fringe box office records and The Way was a Toronto Star Producer’s Pick. Her first production, Just Another Day on the Hunt, won Best Direction and Best Production at the Hart House Drama Festival. She's also received rave reviews for her direction of The Bear, Sailor’s Song, By A Thread and Echoes. In film, she has directed documentary shorts for TVO’s Get Involved and assisted the direction on the feature, Fondi ’91. Her first short film, Now & Then, did the festival tour and was was featured in The New York Times. She is also an award winning film producer for The Evening News. Angela is the owner of Inside Light Studio where she coaches and produces self-tapes for actors and runs weekly scene study and on-camera classes in Toronto. Adam Crosby (Director Of Photography) is a Toronto-based cinematographer who' has lent his design and perspective to a constantly widening variety of projects: short and long format narrative, documentary, commercial, music videos and episodic content. At the forefront of his work is a commitment to storytelling; his passion for creative collaboration is evident in the strong aesthetic philosophies that underlie his body of work. Ian LeFeuvre (Composer) Ian LeFeuvre is a Toronto based composer, singer, songwriter, producer and player of the many instruments that live in his studio. Ian is currently signed to Vancouver/LA based Nettwerk records/publishing. Somewhat of a veteran of the Canadian indie music scene, Ian has continued to develop his ever widening musical skill set, in more recent years emerging as a rising televison/film composer with a unique voice of his own. Kelsey McNulty (Singer/co-writer) for the original song No One Really Sees Me.